Our chaps are great quality leather. Standard inseam length on all chaps is 34". Most people either cut to length or fold up ends. Please measure carefully over your favorite riding jeans. 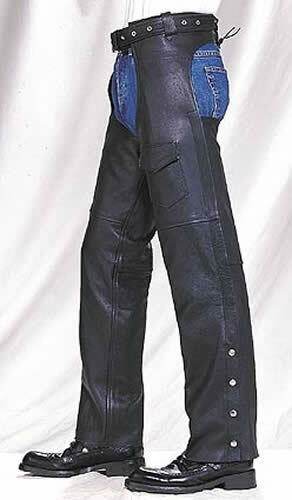 This is a nice set of heavy cowhide leather chaps with zipper pockets. Length adjustable by cutting to length. Measure thigh over riding jeans. Please see sizing chart. Price depends on size. 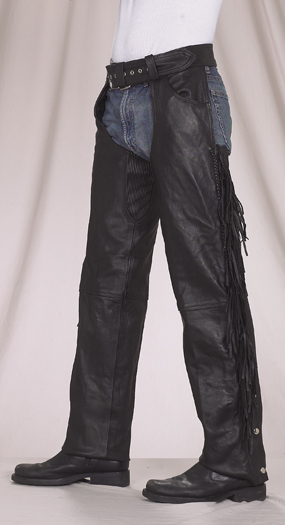 Deluxe chaps with both braids and fringe. These heavy duty chaps have gathers at the thigh. Measure thigh over jeans and see sizing chart. Actual price depends on size. 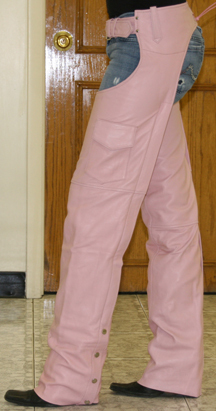 Nice heavy duty chaps in Pink Leather. Limited sizes available. Same heavy duty leather as zipper pocket. Flap pocket instead of zipper pocket. 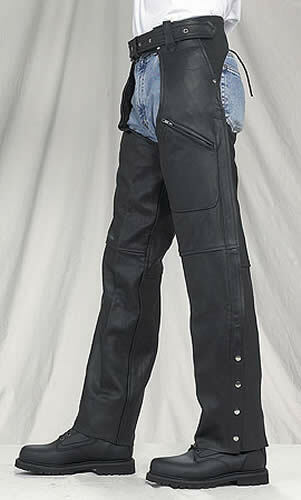 Use sizing chart, price depends on size, please measure thigh over riding jeans. 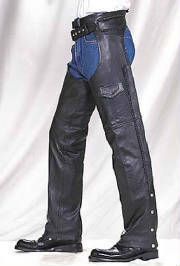 Very stylish braided leather chaps. This is another of our popular items. Great quality chaps at a great price. Please measure thigh over riding jeans. Price depends on size.